$100 Cash Giveaway ~ Straight to Paypal! 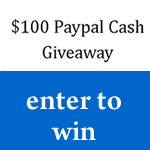 →$100 Cash Giveaway ~ Straight to Paypal! You have your chance to get this whole sum sent straight to your Paypal account. There are lots of things you can buy with 100 bucks. This will not make you rich though. However, its value cannot be neglected. This giveaway is being done by my friend Oloyede Jamiu. Last month, in his September income report, he promised this giveaway. It’s good to note that he has kept to his word. Entering this giveaway is quite simple and straight to the point. Oloyede has clearly put everything on this post on his blog. I don’t want to repeat what he has laid out. Oloyede is using the kingsumo WordPress Giveaway plugin to run this contest. I personally have used RaffleCopter and Punchtab for most of my giveaways. I never tried kingsumo before. KingSumo has however an interesting feature that can add more to your chances of winning. As a participant, you will be generated a unique “Lucky” url. With this, you can promote the Giveaway, earn more points and stand a better chance to win. For each you participant who comes in through your unique URL, you earn 3 points. The more your points, the more your chances to be picked winner. You can share your url on Facebook, Twitter, LinkedIn, etc. You can even post about the giveaway on your blog and link to it using your unique url. There are more ways to promote your link on Oloyede’s blog so go check that out. Amazing giveaway. I will surely participate in this giveaway. You are so humble that you share other’s stuff everytime. I am also offering a “Rankware Tool Free Membership For 1-Year Giveaway” on my blog. We are really missing Broaded.net. Is it fine and safe now? Thanks for sharing this giveaway with us. Have a nice day! I will spend my all winning price to get a hosting for my blog Techoogle. I’m newbie in this blogosphere and want to explore more, Learn more about blogging. This $100 means lots to me and for my blog and thanxx to Enstine Muki for this giveaway. That would be a good way to spend the cash received. Just promote your lucky url. You will have more chance of winning. I don’t know what to say after seeing this but to thank you. I feel honoured that you introduce this giveaway to one of your audience. I know one of your readers would be the one to win this giveaway. Until then, let see what’s going to happen. Thanks for letting us know about this giveaway. I am in a real need of money and would wish to win this giveaway. Will also use some for my blog. Thanks again for sharing this giveaway. I will be happy if you win this giveaway because you are really in need of the cash. I wish you success, just promote your lucky url, who knows you might be the lucky guy. Looks quite amazing and I’ll be heading over to the giveaway site now. Nice! Will check instruction over at letescape and subscribe for updates as well. Thanks Enstine and best of luck with BroadedNET! PS: A favicon should be nice to BroadedNET, ain’t see any on my end. Good to see you back after that glitch in BroadNET You sure fixed that quickly! As for the contest what would I do if I won? Well whenever I come across “easy money” I usually give it away to someone in need. It’s an old tradition in my family. I don’t know where that originated from, but even when I win money in a scratch off ticket, I donate it. So…that is what I would do. Thanks for notifying us about this contest, even i had never used any other plugin except Punchtab, but sometime that slow down loading time of my blog so i had stopped using that. Thanks for letting us know about the contest. It is an amazing way to increase readers engagement with cash give-away contest. Here the prize money is also quite reasonable and will attract a lot of contestants. I appreciate your way of supporting other bloggers including me which shows you did have passed a hard time of struggle to now reach at the height of success. I hope to see you around to partake on the giveaway. Thanks for letting me know about this contest. A Big Congratulation for recovering broaded.net from massive attack. BTW I face some problem while using broaded.net widget. Hope it will fix very soon. $100 bill? Waho! This is huge. I love to make money, and will surely pertake in this. Thanks Enstine and much thanks to Oloyede for organizing such a great give away like this one. If I win? I put it back into the community in another way round. I dropped by Oloyede’s blog and checked out the contest. That’s so nice of you to support him like this and I know he really appreciates it. That’s what friends do for each other right! I’ll be sure to spread the word as well and good luck to everyone. Who doesn’t love Giveaways and contest. They help you interact with more and more bloggers as well as you get awards for doing almost nothing. Thank you so much for linking me to Oyedele’s blog through this post. I wasn’t familiar to him and his blog. Its only through your blog. Thanks again for informing us about the giveaway. Do have a great week ahead! I stumbled upon a few blog commenting monetary giveaways just a couple of weeks ago and now I feel as if it’s the Baader-Meinhof phenomenon, where I’m being inundated with this thing I never knew existed until recently. I think it’s an interesting idea and a generous one at that, but my question still remains in the value of such a giveaway. It’s obvious people will comment as much as possible to have the best chances of winning, but is the impact sustainable and producing thoughtful commentary? Are the contributors likely to return on a regular basis? I’d like to see how rewarding the giveaway is to the blogger promoting this method. Its very sad that i missed this $100 giveaway. That is what you get when you miss Enstine Muki’s post. I know its not late for you if you are determined to win this giveaway. Its all depend on you anyway. I visited your blog recently and found it very interesting. But I was too late to participate in this giveaway. Hope I can in the next giveaway.